More than ten million patients now travel abroad every year for affordable, high-quality healthcare. From Thailand's American-accredited Bumrungrad International Hospital to Eric Clapton's Crossroads Center in Antigua to Johns Hopkins International Medical Center in Singapore, health travelers now have access to a full array of the world's safest, best choices in healthcare facilities and physicians. Now in its third edition, Patients Beyond Borders remains the best-read, most comprehensive, easy-to-understand guide to medical tourism, written by the world's leading spokesperson on international health travel. 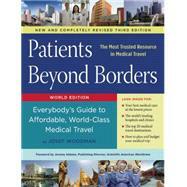 This new edition of Patients Beyond Borders lists the 25 top medical travel destinations, where patients can choose from hundreds of hospitals and save 30-80 percent on medical procedures, ranging from a comprehensive health check-up to heart work, orthopedics, dental and cosmetic surgery, in vitro fertilization and more. As CEO of Patients Beyond Borders, Josef Woodman has spent eight years touring more than 200 medical facilities in 35 countries, researching and vetting international healthcare options. Co-founder of MyDailyHealth (1998) and Ventana Communications (1987), Woodman's pioneering background in publishing, health and technology has allowed him to compile a wealth of information and knowledge about international medical care, telemedicine, wellness, integrative medicine and consumer-directed healthcare. Woodman has lectured at the UCLA School of Public Health, Harvard Medical School, Duke Fuqua School of Business, Johns Hopkins University, Scientific American and the International Society for Travel Medicine. He has keynoted and moderated conferences on medical tourism and global healthcare in 20 countries. He has appeared in numerous print and broadcast media, including The Economist, The New York Times, CNN, ABC News, Fox News, Huffington Post, Barron's, The Wall Street Journal, and more. Woodman is an outspoken advocate of affordable, high-quality medical and preventive care for healthcare consumers worldwide. He lives in Chapel Hill, NC. Jeremy Abbate has served for the past six years as Publishing Director for Scientific American WorldView magazine and Director, Global Media Solutions for Scientific American. Previously he was Director of Business Development at The Scientist magazine. He lives in New York. Chapter One: What Am I Getting Into?